The steps of a good man are ordered by the Lord. In the fear of the Lord one has strong confidence, and one's children will have a refuge. 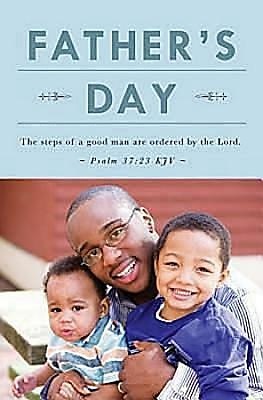 This bulletin, with its cover design of father and children, is a nice memento of Father’s day for all in your congregation. Father’s Day is one of the special days for the church and the world at large. It allows us as a church family to take a moment to recognize not only the fathers in our congregation but also all the men of the church as they help nurture the children within the community of faith and out in the world at large. Bulletin is 8½” x 11” unfolded and 5½” x 8½” folded. Don’t forget Mother’s Day is May 13, 2012. Check our Mother’s Day bulletins in the Related Products Section below. In 1926, a National Father's Day Committee was formed in New York City. Father's Day was recognized by a Joint Resolution of Congress in 1956. In 1972, President Richard Nixon established a permanent national observance of Father's Day to be held on the third Sunday of June. Abingdon’s Lent-Easter 2012 Seasonal Bulletins and matching pieces provide a beautiful array of designs to enhance seasonal worship services and special communications with your congregation. This annual series includes bulletins, letterheads, and offering envelopes for all your Easter services as well as bulletins for all the special Lenten and Holy week services. This series also provides options for the all the special services throughout spring and summer, like Mother’s Day, Father’s Day, Graduation, and more. To see our full selection of seasonal bulletins search by typing keywords: Abingdon’s Seasonal Bulletins 2012; and click “search”.